Green Beans (also known as String Beans or French Beans) are in season right now, which means that beans from around here are abundant and we don’t have to make do with imported stuff from Northern Africa. 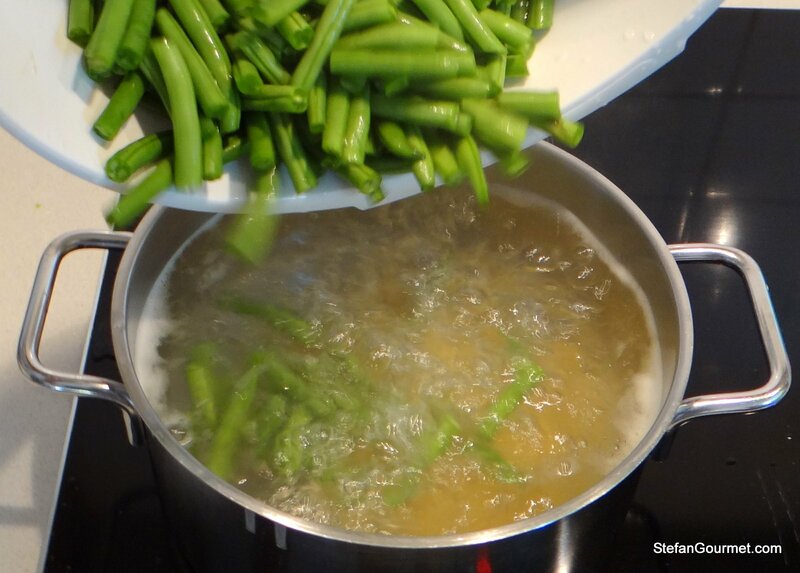 Green beans and haricots verts are essentially the same thing, but the name “haricots verts” outside of France is usually reserved for the thinnest ones only. 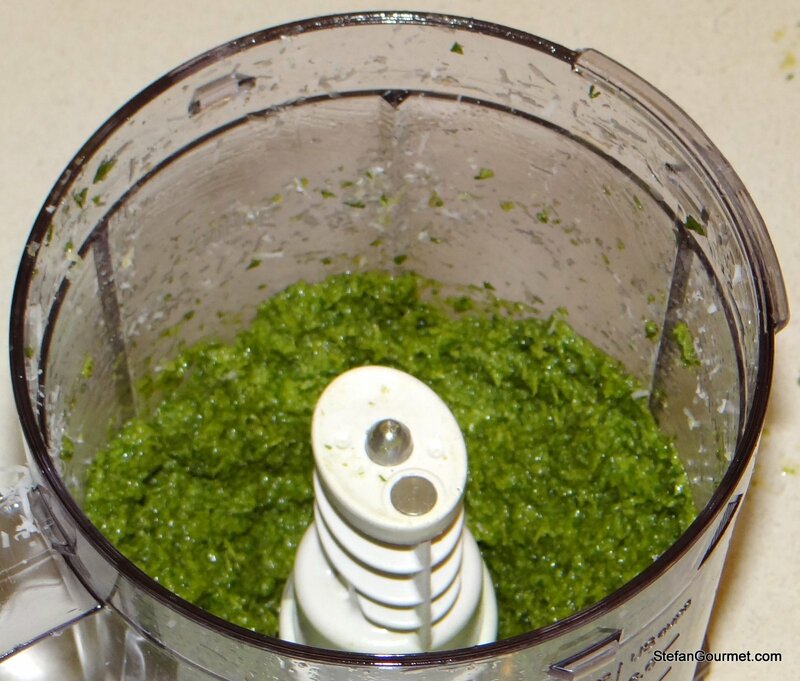 Start by making the pesto. It is actually best to do this the day before to allow the flavors to develop. Remove any tough stems from the savory. 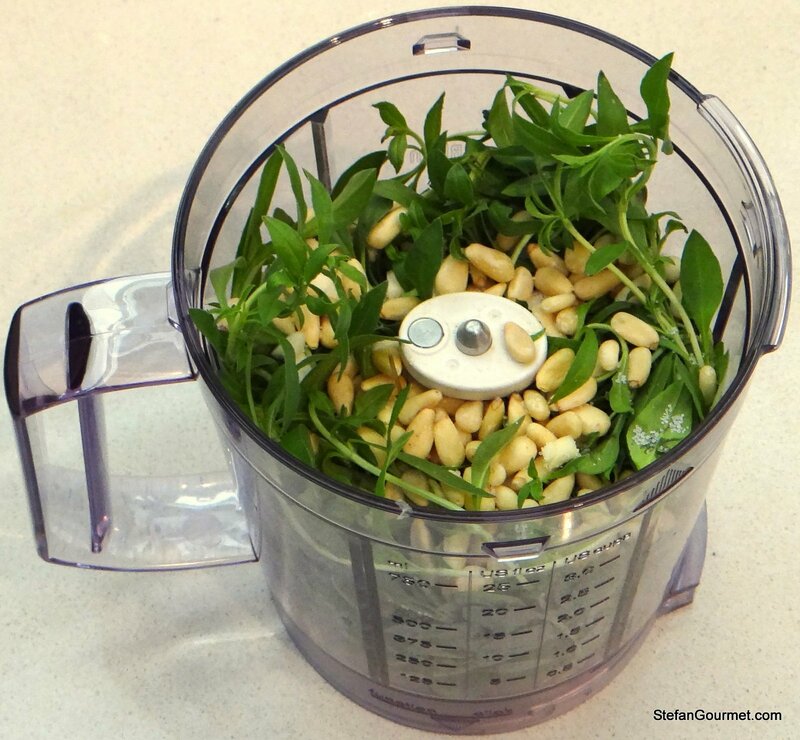 Combine the savory with the pine nuts, the garlic, a small pinch of salt and some olive oil in the blender. Only a small pinch of salt is needed, because savory is indeed very savory by itself. Pulse until coarsely ground, adding a bit more olive oil if needed. 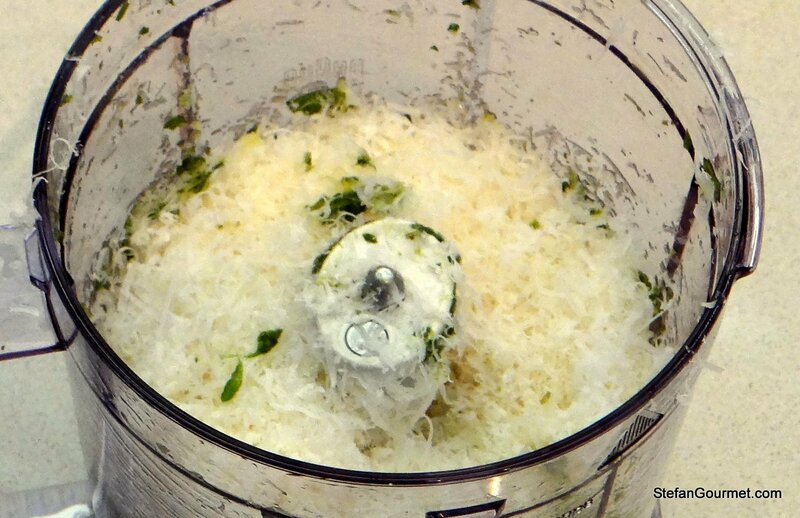 Add freshly grated parmigiano reggiano. Process just long enough to incorporate the cheese. 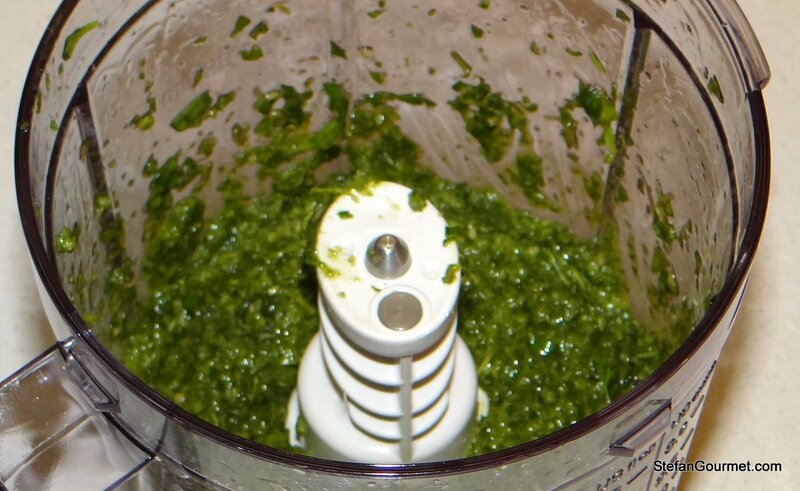 If storing until the next day, put the pesto in a bowl, cover with a thin layer of olive oil, cover the bowl tightly with plastic wrap, and refrigerate. Bring a pot of water to a boil. Add salt and the pasta. Cook the pasta al dente according to the time indicated on the package. Add the beans about 10 minutes before the pasta is done, depending on the thickness of the beans and how you like them cooked (snappy or softer). 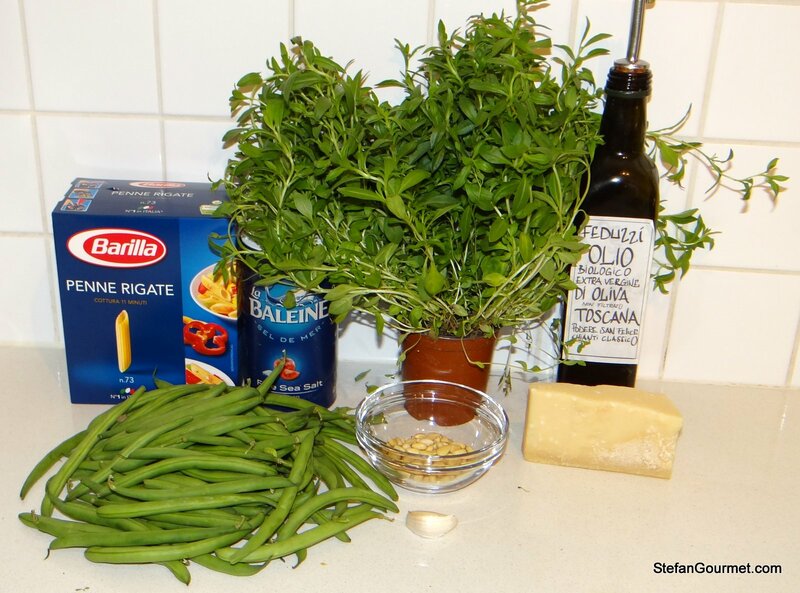 Drain the pasta and beans at the end of the cooking time, reserving some of the cooking water. 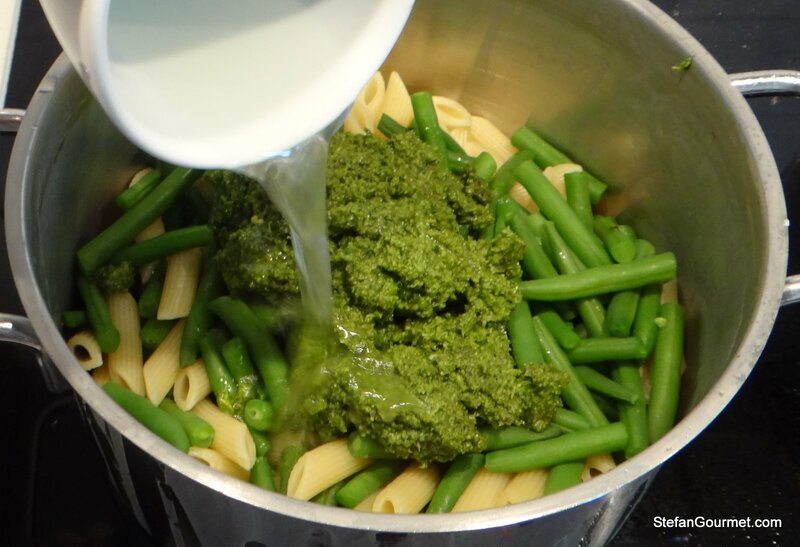 Combine the pasta, beans, and pesto in the pot or a serving dish and add a bit of the cooking water. 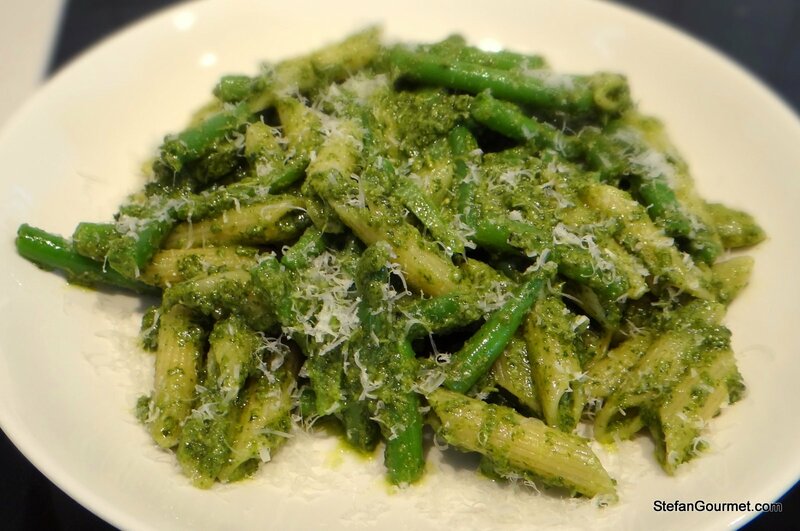 Serve immediately on warm plates, sprinkled with some more freshly grated parmigiano reggiano. Like the dish, I’m green. Green with envy. Lovely looking dish. Although we live close to a metropolitan area, finding fresh and healthy herbs is very difficult. This pasta looks so healthy and delectable. Thanks, Fae. Perhaps you can grow your own? I first thouht the dish was making pastas using bean juice. nah, looks very yum! Would be difficult to make flavorful pasta out of bean juice I think. Now why have I not thought of this? OK, may have to wait for savoury for a few months – my two pots outside do not look too healthy 😉 ! That looks absolutely scrumptious!! OK: to try settle ‘an Oz argument’ ere Saturday night pleasures, yes, herbs are freely available in Oz markets, but they are quite expensive and savoury often does not feature!! Pace!! Thanks 🙂 I hadn’t realized that savory just like labor is written with an additional u in some places. Herbs are quite expensive around here in many places too, which is why I grow my own and buy them wholesale when I can. Stefan – you have actually brought up a very interesting point!! I wrote naturally without thinking about spelling: Next time I go to a nursery, I really have to have a look :D!! I would not dream spelling ‘labour’ without the ‘u’!! But I have never thought of ‘savory’ with it!! How delightful to find out 🙂 ! Why? Thanks for the query!!!! Anyways: grow your own if you can and [perhaps] let the spelling take care of its own 😀 !!! What a great looking pasta dish! Lovely!!! 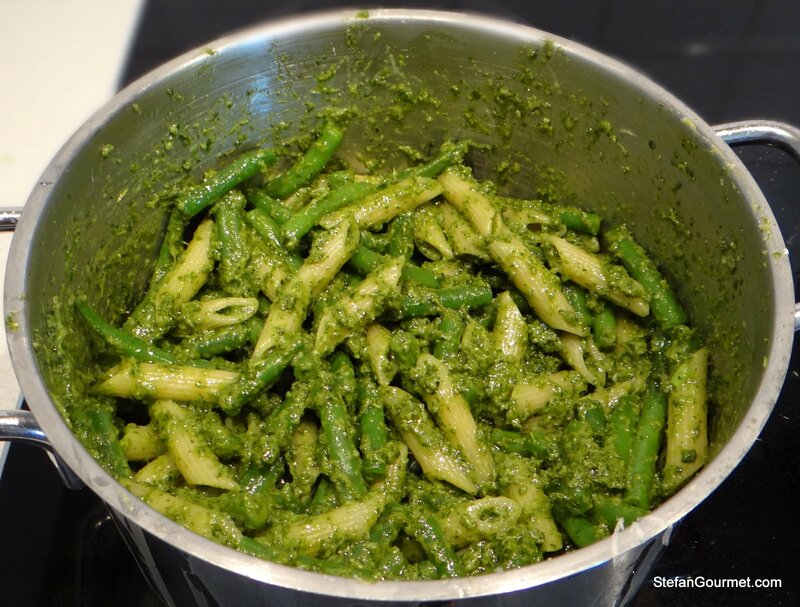 I’ve not used savory before, Stefan, but I do love string beans with pesto & pasta. A bit of savory may bring new life to this old favorite. Thanks for the inspiration. Thanks. Do you use the beans raw for this?